In the first two pages of Blackest Night: Green Lantern Corps, writer Peter Tomasi reveals that a major character told a major lie unbeknownst to the reader a couple volumes back. It's a moment that's shocking, and yet entirely true to the character -- and the story maintains this level of emotion and action almost all the way to the end of the book. Maybe because I was never a fan of the original Green Lantern Corps series, I never get very excited going in to the new series, but Tomasi's last outing, Emerald Eclipse, was one of DC's best books this year, and this volume is equally good, only a smidgen behind Blackest Night: Green Lantern in terms of the best of the crossover companion volumes. 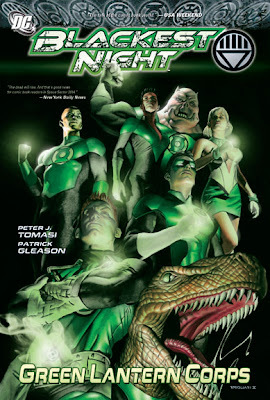 Just as the Green Lantern volume celebrates that title's fiftieth issue, this book feels like an anniversary of sorts. Right in the center of the book is a two-part story called "Red Badge of Rage," one issue of which follows Kyle Rayner and the other Guy Gardner, and both feel like a "rebirth" for the characters. Kyle dies to save Oa, and what follows is a truly harrowing sequence where fellow Lantern Soranik and the Star Sapphire Miri struggle to resurrect him; Guy Gardner's rage at Kyle's death, meanwhile, causes him to become a berserker Red Lantern. There is romance, drama, action, and (considerable) violence all in these pages, and it's believable and heartfelt because Tomasi ties it all to who the characters are. Even Kryb, horrific baby-stealer of the Sinestro Corps, ends up sympathetic in these pages, with her sorrow over the death of "her" babies turned Black Lantern zombies. Indeed, it seems as though Tomasi has been setting up, for years, the reader's abhorrence for Kryb solely for the purpose of turning it all around in Blackest Night's "War of Light." It's this kind of expertise that makes Tomasi's Green Lantern Corps more than just a cosmic DC Comics title; this is very, very strong stuff. As well, whereas the horror of the Black Lantern zombies becomes old hat especially in the Green Lantern volume, Tomasi's Black Lanterns come off rather more seductive and ultimately tragic. The reader appreciates Kyle's confusion over the resurrected Jade zombie; as well, artist Patrick Gleason gives Kyle a bold, angular heroism in the scene where Kyle and Jade simply talk that is perhaps the best Kyle has ever looked. Similarly Tomasi's sequence where Lantern Kilowog fends off the attack of a former instructor, and must then face all the dead Lanterns that Kilowog ever trained, is absolutely heartbreaking. If there are any drawbacks to this book, it's that it stops at some point being a Blackest Night tie-in. There's maybe one issue too much dedicated to the Lanterns trying to free Guy from the red ring that seems like it might be a placeholder while other Blackest Night action takes place elsewhere, akin to the one-shot John Stewart issue in Green Lantern. It's not a bad chapter, but Blackest Night falls away. After that, Green Lantern Corps jumps into the thick of the Blackest Night action for its conclusion, and heaven help you if you're not reading Blackest Night. The majority of Corps is a rather self-contained tie-in, as opposed to the very dependent Green Lantern volume, but the end of Corps is thoroughly in Blackest Night and makes no effort to explain itself. Some parts, even, don't much make sense -- how is Guy able to shatter the Black Lantern Ice when she's possessed but not actually dead? What power causes Kyle to believe he's Major Force? And if the Anti-Monitor wants to escape from Nekron's battery, why do all the Lanterns fire at him? To the extent the story goes off the rails here, however, the chapters before that point are well worth it. Green Lantern Corps ends with a Blackest Night epilogue, of the sort I imagine we'll also see in the next volume of Green Lantern. Aside from a great scene with two of my favorite characters -- Lanterns Vath and Isamot, the partners from warring planets -- not a gigantic amount changes in the Lantern status quo post-Blackest Night, and even Tomasi notes, through Guy, that it's another moment of rebuilding themselves after a half-dozen before. As much as I liked this story, I have to admit that parts weren't much different than the wild multi-Lantern fight sequences of Emerald Eclipse. Tomasi moves to Emerald Warriors after this volume, with Tony Bedard joining Corps, and hopefully that's a shakeup that will continue Corps level of excellence, reinvigorating the title while adding a companion just as good. Green Lantern still leads as the best Blackest Night volume in my opinion, but Green Lantern Corps is a close second. Next up, we explore the wider DC Universe with Black Lantern Corps -- see you then! I have to admit that I found the end just as jarring - it was weird to see a collection which had followed its own arc to that point cut from the charge of the light brigade to the aftermath of the crisis. On the other hand, I loved the epilogue issue -I thought it was as close to a mission statement for post-Blackest Night DCU as those of us wait-for-traders are likely to get before the major Brightest Day releases in January. I found Hal's "death is death" statement at least an inkling of what the post-Blackest Night DCU would be like, but I didn't hear the same in the Green Lantern Corps finale; I think I was not as sold on the epilogue as you were. Do you mean the Kilowog scene? Are you reading Brightest Day, and do you find Kilowog's sentiment reflected there? I kinda mean the whole feel of the issue. From Saalik telling the Guardians where to shove it (and affirming the Lantern Corps as proactive rather than reactive), to changing the memorial for Green Lanterns from a crypt to a tree (celebrating life rather than wallowing in death). Kilowog's scene obviously plays into that, with the "just a space cop" line, but it was more a general feeling than a specific scene or line. It just felt like Tomasi was promising a brighter tomorrow. I'm waiting for trades on Brightest Day, so my comment isn't really informed by anything. I think this was my favorite crossover hardcover from the series, for many of the reasons you mentioned. Thanks to Johns and Tomasi, ancillary members of the Corps are few and far between; it's not just Hal, John, Guy, and Kyle that the reader cares about, but every other lantern. Not to mention the coolest seven words I've read in a comic all year: "I guess Mogo does socialize after all." I hope that with a third Green Lantern franchise book, Vath and Isamot can be more in the spotlight in Corps, speaking of ancillary members. That their planets hate one another, but that they have to be partners in the Corps, has seemed central to me to what this book is about. Saalik telling off the Guardians is something of a major moment, though I felt in part I'd seen it before -- it seems every other day, Guy or Kyle or someone is telling off the Guardians. I think I hoped for some real solid status quo change (for instance, the ability to use lethal force after Sinestro Corps War) -- but I understand that may yet be coming in the next volume of this book and Green Lantern. Wonder when those will be solicited?